Meanwhile the Earth is spinning on its axis. Like the rotating restaurant on the top of a cheesy hotel we are constantly pointing in a different direction. That creates a photographic problem and opens a photographic opportunity! A few nights ago I pulled “Clicky” out and shot the night sky. My intention was to produce a time lapse as the stars rotated by (at the bottom of this entry). As I showed the video one thing became obvious. Many of those who saw it didn’t realize they’d see that effect from a camera in a fixed position. We’ve become out-of-touch with the nighttime sky which no longer is as visible nor has the importance it did to our great grandparents. Stars are very, very far from us. The closest star (other than our own Sun) is Proxima Centauri which is about 25,260,733,353,600 miles away (that’s 25+ trillion miles)! Others in the visible sky are thousands or even millions of times more distant. That keeps our view of stars reasonably constant. The opportunity is time lapse. What my little movie shows isn’t stars moving, but the effect of the Earth rotating&#185. Aiming at any single point in the sky reveals stars passing by. They’ll return to about the same point 24 hours later. The photographic problem is the same one faced any time you try to photograph something in motion: blur! Because stars are dim the only way to photograph them is to keep the shutter open a long time and allow more photons to hit the camera’s sensor. 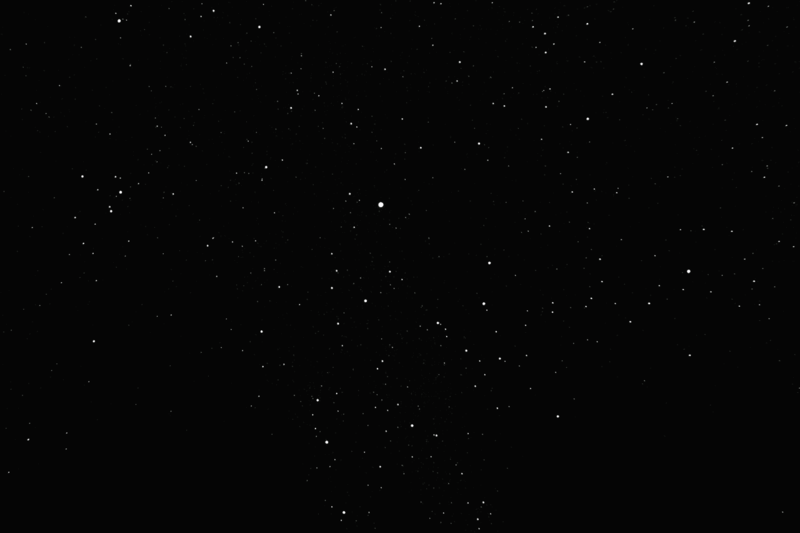 The longer the shutter is open the farther those stars move. The result is streaks across the sky, not points of starry light. Sophisticated astronomers (aka – not me) solve this problem with clock drives. Their telescopes and cameras move in exactly the opposite direction as the Earth. The effect is to hold the stars still. There are simple mechanical devices that do exactly the same thing. I’ve got a little wooden wedge with a hand turned screw which allows my camera to take long star exposures with impunity. Nowadays the easiest way to eliminate the blur is with a software assist. When I shot my time lapse I took over 400 images one-after-the-other. Each was a single second’s look at the sky. Using a program called DeepSkyStacker I combined those images and restacked them eliminating the effect of Earth’s rotation. As a bonus DeepSkyStacker looks at specially shot blank frames to understand my specific camera’s weaknesses and counteract them! The resulting photo is the equivalent of an eight minute plus exposure–though digitally made superior. I’ve taken a small piece of it an placed it at full resolution at the top of this entry. Just below it is the full frame (though not at full resolution). These shots, compilations of over 400 separate photos, show stars I couldn’t see with my naked eye. It’s all very heady stuff and amazing to me. It’s not just that these techniques are available, it’s that they’re available to anyone for free and easily used with cameras a lot less sophisticated than mine. &#185 – Here’s re-tweaked version of my time lapse nighttime sky movie from a few night ago. This totally amazes me! It’s true we don’t get to star gaze anymore–too many lights, haze etc. Makes me think I should plan an evening road trip to a meadow away from city lights~ Couldn’t help but notice early in your clip 2 very bright close together stars.. Any idea what they are? Thanks again for sharing this info! Probably an airplane. My shots are one second on, six seconds off. It was in frame for one shot and blinked three times. Just reminds us of how small we really are.